In the last Big Ten quarterbacks article, we looked at the Northwestern Wildcats and their QB situation. It’s only fair that in the next article, we look elsewhere in the state and check out the Illinois Fighting Illini. Unlike the other Big Ten team in the state, Illini fans can hardly be content with their team’s results. Their two wins came against Ball State and Western Kentucky, in the first two games of the season. Every game outside of those two went down as a loss, and as you would expect from a team with a two win record, Illinois experimented with quarterbacks. Jeff George Jr. had the most snaps and attempted 181 passes, throwing for 1,273 yards and seven touchdowns all season. However, Chayce Crouch also attempted 91 passes, ending the season with 443 yards and a single touchdown. Freshman Cam Thomas also had a bit of playing time, with 66 attempts and 375 yards. It seems like Illinois should have options going into next season. A bad turn of events hit the Illini, and now the pressure falls on one player. After announcing in January that he was going to transfer, Jeff George Jr. picked Michigan as the school where he’ll spend his last two years of eligibility. At least Illinois has Chayce Crouch, right? Well, Crouch decided to walk away from football despite being a junior last season and having one year left during his college career. “I don’t think there is anything left to give. I have decided to hang up the cleats and end my career as a Fighting Illini. At this point in my life, this is what is best for me and I hope you all respect my decision,” Crouch wrote. With his retirement, only one of the Illini quarterbacks to attempt a pass last season is still on the team. Cam Thomas played in four games last season, his pass attempts increasing game by game as the season came to a close. The numbers weren’t good. 42% completion percentage, no passing touchdowns, and five interceptions. But with the team as a whole going winless in the conference, you can’t blame all of it on Thomas. 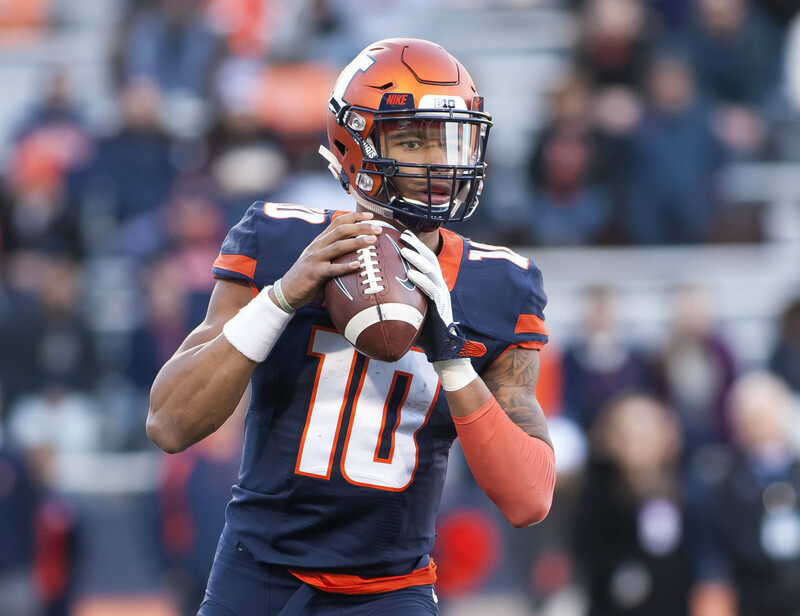 The Illini just weren’t a very good football team last season, and there was no realistic way that a freshman quarterback like Thomas would make them look better after entering so late into the season. Still, Thomas has the potential to progress his game entering his second season. The starting job will fall to him as the only experienced quarterback on the roster, and against Northwestern, he had one of the only bright moments of the game for Illinois and showed what he can do while tucking and running. In the Illinois spring game, he showed his progress in the passing game and threw a 71 yard touchdown to Caleb Reams. “He can do everything. He’s so smart, he puts us in a great position to make good plays,” said teammate Reggie Corbin, about Thomas. During spring ball, head coach Lovie Smith emphasized that while Thomas isn’t completely ready, he’s shown potential and is moving in the right direction. Whether or not Thomas will be starting material by the time the season rolls around remains to be seen. They really need him to be. The team has enough problems to deal with next season without worrying about whether or not the quarterback will blow games.